I posted it up on social media and the response was pretty good. I decided I liked it so much it would make some cool wall art for my office. All from the iPad I exported the image, sent it to CVS, and in an hour I had an 8×10 ready to picked up. I headed to the pharmacy and bought a $5 frame and $4 for the printing. All in all a $9 investment for what I think is a cool art piece. I did change the text to ask one of the primary you should always be asking yourself, “are you solving the right problem?”. So many times when we hit a complex problem the easiest answer is to start over from the beginning and figuring out what you are actually solving and if there is a better way. I have a problem where I want to rearrange my office every month. I don’t know why but it just starts to feel stale and I feel like it gets to routine. This is only February and I’ve already moved stuff around three times this year. I may need an intervention. Pictured above is my latest setup. I moved the desk in front of the window so I can look out and see the little patch of woods. Every time I look up I can now see squirrels and birds doing their thing. If you ever get tired of your workspace don’t discount rearranging. With no money invested it makes you think you have an entire new space. This image was acquired by taking 50,000 images of the lit surface (25 tiles at 2000 frames each) and stacking the best 50% of the frames. Acquisition was done with a ZWO ASI224MC. 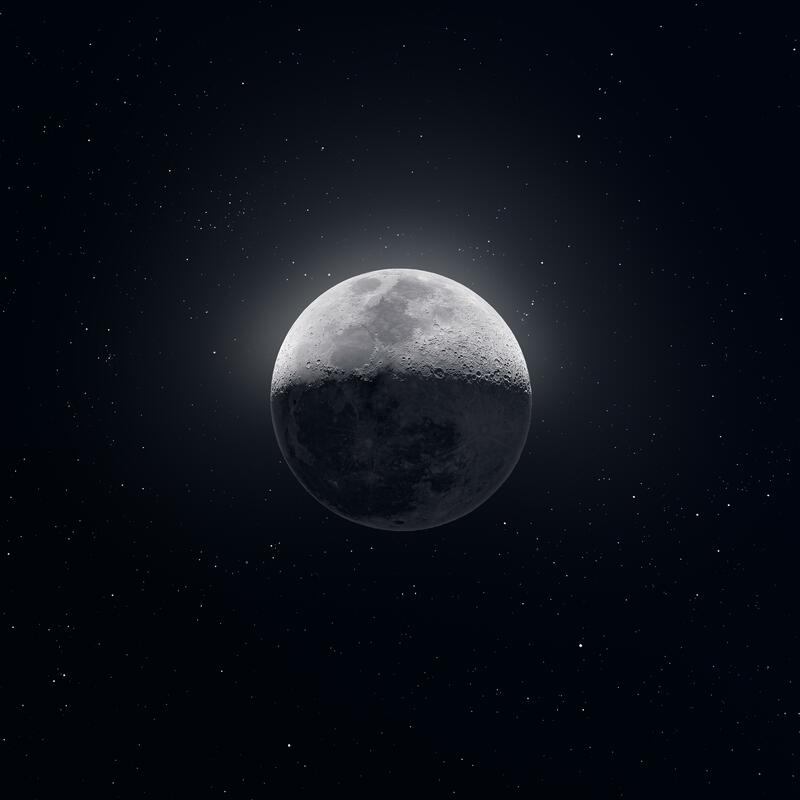 The earthshine portion of the moon was captured with a Sony a711, and was a mosaic of 13 tiles with the best of around 20 images per tile stacked. The stars were taken with a stack of 50 images with the Sony. The telescope I used was an Orion XT10, mounted on a Skywatcher EQ6-R Pro. It works great as a background image. Recently I started reading Cal Newport’s new book Digital Minimalism and although I’m only a few chapters in it’s pretty enlightening. The beginning talks a lot about the habit of social media and how the apps are designed to keep up coming back for the next “hit” when you are bored. He talks about going on a 30-day detox from all social media and then after you’ve broken the habit slowly add things back that will enrich your life. Not bad advice but I love the Twitter water cooler and I’m not willing to give it up. Sorry Cal. But I did decide to take it to heart and try to rework the way I use all social media. I’m trying to not use Safari to access social channels and I’m logged out of all of them. Then if I really want to check it then I must use a computer. If you need to get in touch with me your best bet is email and I’ve turned off public DM’s on Twitter and all notifications. You don’t realize how addictive the apps are until you delete them all and then stuck in the slow line at the grocery store. It brings back some nostalgia seeing the headlines of the tabloid trash at the checkout aisle for the first time in years. I’ve been talking to a friend about pricing a new product and figuring out what to charge, especially when you are first launching, is hard. Really hard. It feels like you are just putting out a guess and hoping it works. As I thought through the pricing I wanted to share some of my thoughts on it, and what I would do if I was launching a new product today. Much of what follows should be looked at through the lens of a brand new product. Before even thinking about pricing I’d want to have a pretty good idea on what my expenses are. Without that how do you know where your break-even point is? You don’t, and you are just guessing. Watch any business show on TV and the first thing anyone wants to know is what it costs for a single item. It should be the same with your product. How expensive is a single customer. Once I had this I would try to figure out how I could fairly price my product. If it’s B2B how can I charge a fair price to a small business, and a fair price to a company of 500? Usually this is done with different plan levels, and a good differentiator is the number of users. To take common pricing terms a single user might be $9 a month, 5 users might be $49, 25 users $129, etc. This is a simple way of segmenting your customers and also easier on your codebase because you aren’t putting feature flags on a million different things. It’s one code base, everyone gets the same features. Of course, users are just one way of doing it, there are tons of others. Just remember to have your packages on simple things that are easy to understand. As a buyer I want to know instantly what package I would need. Out of all the pricing models, I think the two I dislike the most are charging for things I can’t control. For instance, if you are a selling a SaaS CMS and billing based on views or podcast hosting charging by downloads. In either case, the actual amount is outside my control, and I don’t want to have to go create a spreadsheet to see if I’ll fit within a specific plan. Plus neither has any bearing on if I’m successful. I feel like the product creators think income is related to these, but I’m not sure that is the case. It’s never been that way for me. The second model I don’t like is one price for everyone. Basecamp does this and charges $99 a month. I’m a small business and $1,188 a year is substantial. Where a company with 50 employees and 7 figures of revenue this is nothing more than a rounding error. As a true small business, I get screwed every year. Like I said in the beginning pricing is hard and there is no right or wrong way to do it. In my opinion, when you launch your first product it’s better to undercharge and make just a little profit than to overcharge and not get any customers. It’s always easier to raise prices than to reduce them, and once you’ve turned someone off it’ll be very hard to get them back. Think of a new launch getting featured on Product Hunt. Thousands of people will be hitting your site finding out about your creation, if the price is too high, in relation to the market, there is a big probability you’ve lost a lot of really good customers, and you’ll probably never get them back to the site again. I’ll say it again, pricing is hard and I think all we can do is use our best guess and gut instinct to figure out where to start. I’m not sure the best place to share these since it’s not tech stuff I typically share on Twitter, so I figured I’d giver Dribbble a try. If you are interested you can find me at @ericlbarnes and I’m going to continue trying to create a new drawing each day. I’d eventually like to make some geeky comics with basic drawings but coming up with a funny story is quite difficult. If you have anything you’d like drawn just reply below in the comments. I’d be happy to create you something to the best of my abilities and it’d give me some practice. For Laravel News we use a lot of icons for the featured images and these usually come from the Noun Project or Undraw. They are quick to use and work really well. Sometimes I need to change the colors of the icons and a simple method for doing this is with the Sketch App. That’s all it takes to quickly change an icon and it’s a feature I will use a lot in the future.